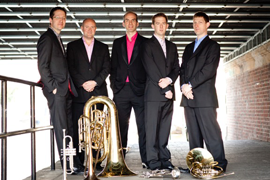 Onyx Brass is one of the rare breed of chamber ensembles whose musical and technical virtuosity is matched by the accessibility and vitality of their presentation. Formed back in 1993, the ensemble is still pushing the medium of the brass quintet with as much enthusiasm and gusto as way back then! From Monteverdi to pieces written by their composer in residence, Tim Jackson, their programme is certain to cater for all tastes.